On May 20th, 2017, the Committee for Green Foothills will be having a Family Bike Ride and BioBlitz in Coyote Valley! It is from 9:00 am – 12:00 pm and starts at the Spina Farm Stand at Bailey Ave & Santa Teresa Blvd, San Jose, CA 95141. 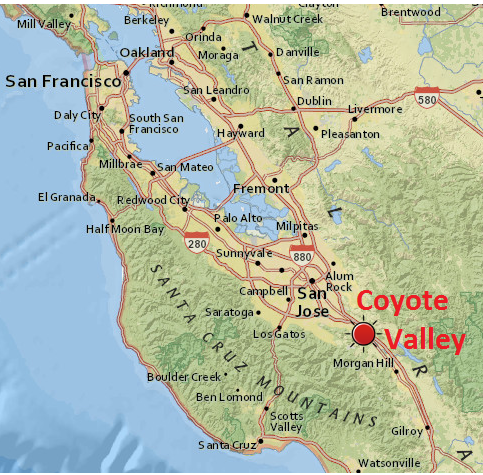 Explore the Coyote Valley region by bicycle! Join us for a flat 5-mile roundtrip bike ride. This is a family friendly event. Please RSVP at the Committee for Green Foothills’ event page. Stay Tuned for more Upcoming Coyote Valley Events! Discover Coyote Valley is planning what’s next for agricultural and recreational opportunities in Coyote Valley for Spring and Summer 2017. Sign up for our e-newsletter to get updates on Coyote Valley events and project work. Are you a group or organization that might be interested in agriculture, food, recreation, or policy related issues of the Coyote Valley? We are collaborating with many growers and partners in the area to offer customized tours and similar events to interested groups. Please contact us with your thoughts or ideas! June 27th was the opening of the Coyote Valley Open Space Preserve! Stay tuned for events in Coyote Valley with the Santa Clara County Open Space Authority and Discover Coyote Valley. We had a blast at the Coyote Valley Family Harvest Feast, and hope you did too! Master Gardeners learn about chile pepper production, and International Culinary Students learn where the food they cook with comes from! View topic and schedule from the Pepper Management Seminar and Chili Field Day from August 28. View the events and activities from May events, and our gallery of May event photos. 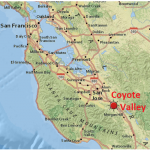 Visiting the Coyote Valley on your own time? Check out these farm and recreation opportunities!